So I stumbled upon this lovely website called LiteraryRejections.com, and I have to say, after the few weeks I’ve had, this discovery was much needed. To be honest, I’ve been a bad writer lately. Not in the sense that I haven’t been writing, or that my stories have been crap (though some *special* lit mag editors may contest this), but rather, that I’ve been playing with the idea that after a few rejections, my writing career may be going nowhere. Thinking about it, that sentiment should be put down as number one on the list of traits of a “bad” writer. The past few weeks I’ve done some editing, a little bit of short story development, and a lotttt of reading. Don’t get me wrong, reading is essential to the process, but I think I’ve lost that necessary balance between experiencing and creating. 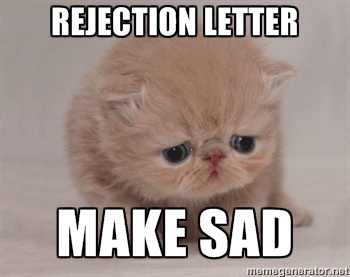 And unfortunately, it looks like the culprit is my fear of rejection. That’s a big problem. We’re writers. That designation is forever married with rejection. So it’s time I woman up and deal with it. Hell, I’ve only been writing in a serious, career-path capacity for two and a half years. That’s nothing. It’s pathetic that I’m even worrying about my career after only two years and a dozen rejections!